Another feather on the hat of Abu Dhabi is ready to be added. The beautiful city would become the proud host of the largest departmental store of the region when the Yas Mall opens in November this year. Chalhoub Group has signed an agreement with Aldar Properties to develop a 200,000 square foot department store, which will be located in prime retail space within Yas Mall. Chalhoub Group, which opened the world’s largest shoe store, the 96,000 sq ft Level Shoe District in The Dubai Mall, two years ago, said the Yas Mall department store “will showcase a portfolio representing the most desirable ranges from over 200 global brands”. “Featuring a large variety of concessions stores and designers, the department store will complement the extensive brand mix found elsewhere in the mall, covering beauty and cosmetics, fashion, accessories and an extensive children’s selection,” read the company’s statement. The new store will be slightly bigger than the current largest single store in region, Galeries Lafayette store in The Dubai Mall, which is 192,000 sq ft in size. Aldar CEO, Mohammed Al Mubarak, said they have created a new concept in luxury retail. 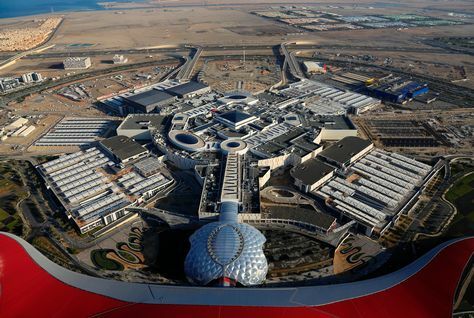 Yas Mall is now 95 percent committed ahead of the opening in November 2014. The remaining units will be leased-up on a selective basis to ensure that they complement the existing retail mix. The mall is scheduled to open in November with more than 300 stores, growing to over 400 stores and outlets including F&B brands, a 20 screen cinema operated by VOX Cinemas, the largest hypermarket in Abu Dhabi which will be operated by Geant and a family entertainment zone. Last week Aldar Properties announced a new partnership agreement with Retail Arabia, which will see a new concept House of Fraser department store open in Yas Mall. The deal will also bring the first Hamleys – the oldest and largest toy shop in the world – store to Abu Dhabi, as well as the first Joe Fresh – the international fashion brand – store in the UAE. Abu Dhabi has always been a special city of UAE and with the largest Departmental store, it would be certainly the most special.